11/21/01-Maggy: "Fu@k this site, this is the last time that I'll update! I HAVE A SOCIAL LIFE NOW. If I make a new site, I'll post the link here. If you steal anything, I'll just take this whole site down! DON'T STEAL OR I STEAL YOUR BABIES AND EAT THEM!!! Good-bye, it was fun, but I'm moving on with my life. P.S. Look what I found: http://www.rotten.com "
Sorry, but the polls closed last Saturday (that's when I drew this pic). If you voted after then, it didn't count. The winners are: Mimi and Iori with 3 votes each for: Which Digidestined would look the best with Hikari's hair? 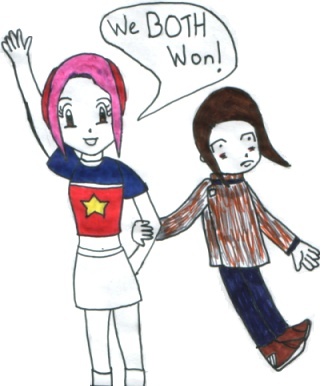 (I have a infatuation with her hair) I guess Iori is pretty inbaressed that he won, but Mimi's luv'en it! I drew the whole thing with markers. Other winners: Dai, and Jun had 2 votes each. Miyako, Yama, Sora, and Kou had 1 voted each. Takeru and Jou had no votes ;( I think I'll make a Doujinshi about this.